Another new project! 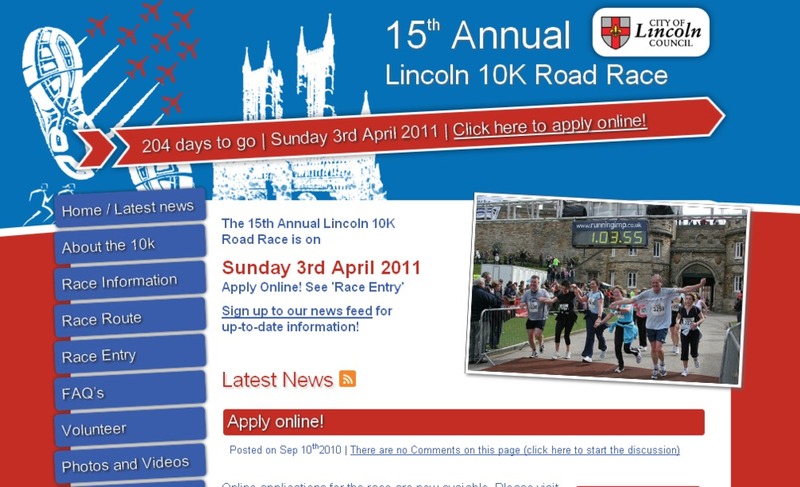 This one is another satellite site, this time to promote the annual 10K Road Race in Lincoln. The site was, as always, designed as a WordPress Theme and deployed to the City Councils hosted WordPress platform. In my continuing push to develop elegantly degrading CSS3, this contains a number of shiny-shiny effects such as drop shadows and transformations, which delivers alternatives for lower end browsers. The design for the site is not 100% mine; I’d originally developed a visually different look for the site which had to be altered at the last minute when the printed material came through looking completely different! Initially grumpy at this turn of events I am actually really pleased with how this looks; the colours and layout are very nice and I felt surprisingly more comfortable working with a given design that having to come up with something from scratch. Check out the site here and sign up if you’re interested in taking part!